Moluccan Rusa (Cervus timorensis moluccensis)We have great quality Moluccan rusa with 5 of the top 10 in the SCI typical category and 10 of the top 10 in the non-typical category. Appearance: Similar to Javan rusa in overall appearance, the Moluccan rusa is smaller in body and antler size. Heavy pearling of the antlers is a common characteristic. Antlers: 3 points per side but with many non-typical specimens. The second tine grows outside of the main beam. Trophy size: Antlers as long as 30 inches have been recorded mature males averaging 20-24 inches. History: In 1912 Rusa deer from the Moluccan Islands were released on the islands off the northern tip of Australia. 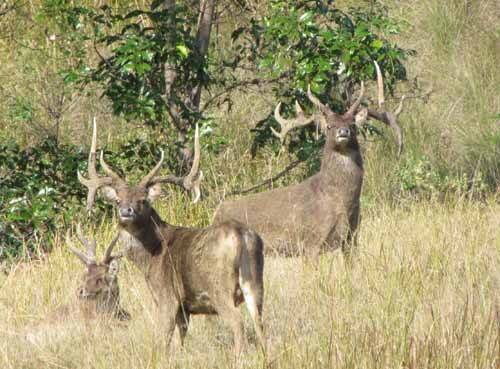 Hunting Moluccan rusa: The Moluccan rusa doesn’t have a clearly defined rut like the Javan, however they will fight hard. They prefer to stay close to or in thick cover and browse a lot.